Enclosed areas where moisture can build up can be a breeding ground for mold and mildew. Particularly in locations where wood and wallboard are exposed, like: 1) under rafters, 2) in damp basement areas, 3) in bathrooms, 4) below open buildings and 5) in attics. Mold & Mildew can be harmful to you and your family as the spores can cause allergic reactions and illness. There are two problems that you need to deal with when you are trying to address mold and mildew: 1) removing the infestation effectively (mold and spores), and 2) preventing it from recurring. REMOVAL: - In the past, most mold removal companies literally had to remove the offensive building materials, address the source of the moisture and rebuild the structure - a very expensive proposition. If the infestation was small it could be treated with bleach or disinfectant products, however, the problems with bleach & disinfectants can be just as dangerous as the infestation - affecting breathing and damaging the building materials - plus the effects of these products are only momentary and there is no lasting effect. Recent developments in microbial cleaning products have yielded effective long term results with the added bonus of prevention of recurrence (when the source of the moisture is repaired). These products remove the infestation and, virtually stand guard, defending the area from re infestation from the spores. PREVENTION: - Once you remove the source of the moisture you have effectively prevented the mold from recurring however, particularly in areas where there is no resolution to the moisture issue (enclosed bathrooms) the mold will return the next time it is moist. Microbial cleaning products are particularly effective in these instances as they can protect the area from some of the recurrence and regular, weekly cleaning with the product can actually prevent it completely. Many mold abatement contractors have discovered the advantages of using microbial cleaning products to treat these mold problems effectively. Over the past few years WorldWare Enterprises Ltd. of Cambridge, Ontario, Canada has developed a number of green microbial products that work well on mold and mildew. Depending on the actual mold encountered, we have products that will effectively remove and prevent the recurrence of these infestations for years to come. The success stories for treating northern grey/black mold and southern brown mold have been impressive as infestations have been stopped and reversed with as little as one application. 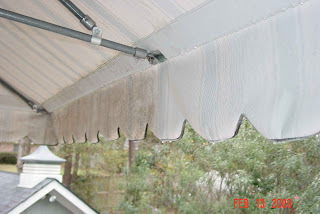 We have written here before about the results for removing brown mold from awnings in Mobile, AL (see picture above, showing before and after) - update: it was over 1-1/2 years ago that the vinyl awning was treated and, as of last week, there is still no recurrence on the awnings (in the same time period neighbors with the same type of awnings have had their awnings treated with harsh chemicals at least 5 times and the mold keeps coming back!). For some time now the most difficult mold type to resolve has been the black mold that is common in many parts of Florida. It is a very resistant mold that is very hard to remove with any success. Recent trials and actual case studies have proven that EATOILS™ SUPERFRESH™ is very effective at removing and preventing the recurrence of this black mold in Florida. For example, our client, William Booth of Tallahassee, FL was having a problem with mold on his exposed wood on the underside of his home. The smell and spores were affecting his family and he had to do something fast! He called our technical service personnel and was advised that we had experienced some success with our EATOILS™ SUPERFRESH™ for this type of application (this product is very good at treating the mold and mildew typically found in damp bathrooms). He purchased a pail of our EATOILS™ SUPERFRESH™ and he set to work on his home - he mixed it as described in the instructions and then he applied it to the exposed wood - and within minutes he noticed a big reduction in the mold. After a second application it was all gone and there has been no recurrence since he treated the wood in April. We spoke last week and he confirmed that he is very happy with the results - another fine job by EATOILS™ SUPERFRESH™ is GREENER-CHOICE™ APPROVED GREEN. If you are dealing with a mold or mildew issue in or around your home or business consider using a safe product to remove the problem. How about ordering some today? Click here.